Influenza, commonly known as “the flu”, is an infectious disease caused by an influenza virus. The most common symptoms include high fever, runny nose, sore throat, muscle pain, headache, coughing, sneezing, and fatigue. These symptoms range from mild to severe and can significantly hinder the productivity of your employees which in turn slows down business operations. 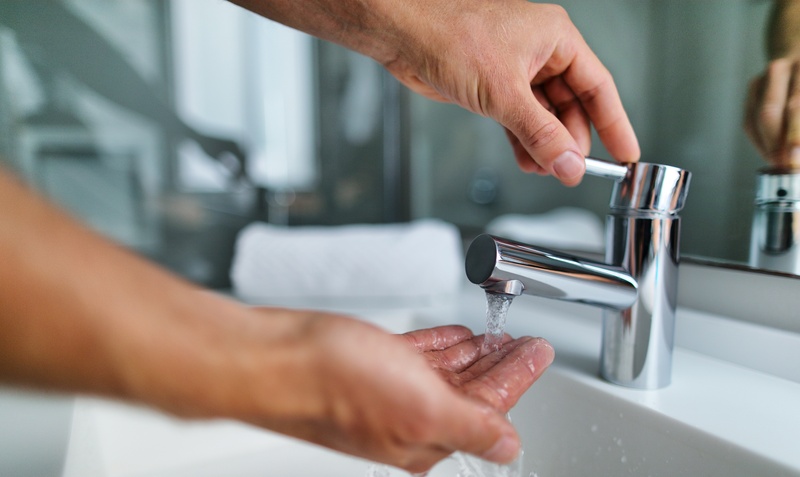 While hand hygiene is important to minimize the transfer of germs; cleaning and disinfecting environmental surfaces as appropriate is fundamental in reducing the number of healthcare-associated infections. 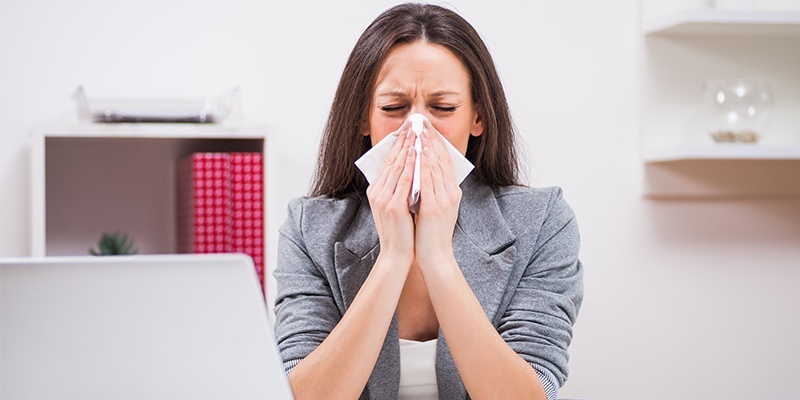 Pathogens spread through contact with people or objects as well as via airborne transmission. Common objects in the workplace that spread germs are doorknobs, shared phones, and faucet handles. These transmission vehicles are called Fomites, touch points that can transmit pathogenic microorganisms from one person to another. Properly cleaning these Fomites removes the pathogenic microorganisms thus breaking the chain of infection. Germs are harmful bacteria. They grow most rapidly in dark, warm, moist environments in which they have an ample food source. Restroom surfaces can be a chief breeding ground for bacteria, which can reproduce in as little as fifteen minutes. 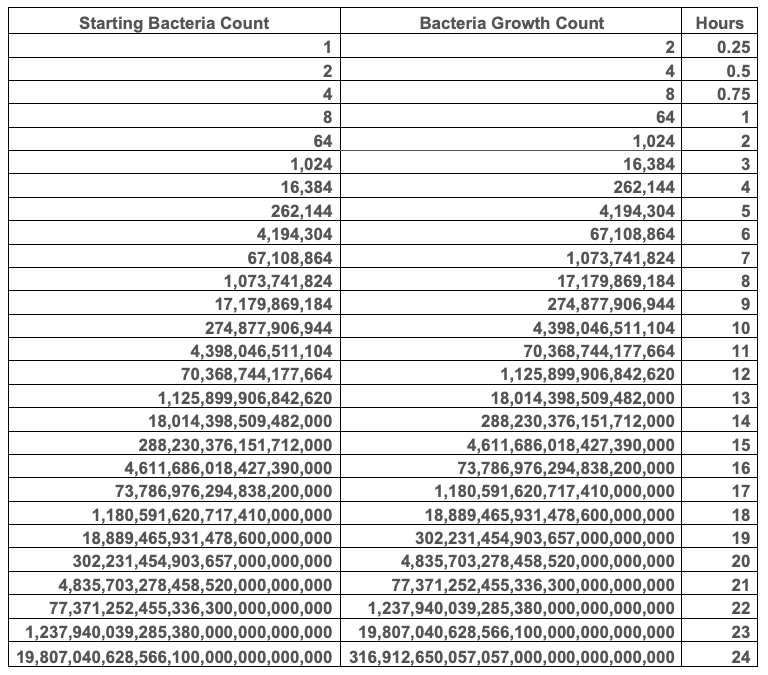 The following chart shows the growth of just one bacterium over a twenty-four-hour period with a fifteen-minute reproduction rate. The best way to prevent the growth of bacteria is to keep surfaces clean and dry. This is what cleaning workers do each day. They spray, wipe, mop or scrub to leave behind a clean dry surface which inhibits the growth of disease-carrying pathogens. For best results, use an EPA registered disinfectant and clean microfiber cloth. Make sure that the disinfectant is properly mixed and that the cloth is used to add friction to the cleaning process for maximum results. Disinfectant/detergent formulations registered by EPA are used for environmental surface cleaning, but the actual physical removal of microorganisms and soil by wiping or scrubbing is as important, if not more so than any antimicrobial effect of the cleaning agent used. The physical action of scrubbing with detergents and surfactants and rinsing with water removes large numbers of microorganisms from surfaces. Partner with a janitorial services company that is properly trained to do their part in protecting your employees' health. Healthy employees lead to higher productivity in the workplace which has a direct, positive effect on your bottom line. Knowing your building and employees are clean and safe gives you the peace of mind to concentrate on running your business.